The 45 Pillsbury Bake-Off is finally here! My husband and I leave today to go to Orlando Florida. I am excited that the day is finally here as it's been a long but fun journey. I just want to take this opportunity to thank my family and friends for all their support and love. Also thanks to my customers at Mocha Moment for being so excited for me and all the kind words. I can't forget to thank my co-workers who put up with me day in and day out as my excitement got old at times (I'm sure!) And thanks to my cousin (boss) Steve Dean who got me my very own Bill Board. How cool is that! Most importantly thanks to my husband and kids because they are why I love to cook. This has been a dream come true and I'm hoping my dream continues and I win the one million dollars! 1 Heat oven to 400°F. Line 15x10-inch pan with sides with aluminum foil. Place cooling rack in pan. 2 In large resealable food-storage plastic bag, combine brown sugar, black pepper and cayenne; shake to combine. Separate bacon slices and place in bag; shake to coat. Place bacon on rack in pan. 3 Bake 25 to 30 minutes, turning once halfway through baking, or until bacon is browned and thoroughly cooked. Cool completely. Chop bacon; set aside. 4 Meanwhile, in 12-inch skillet, cook onions and garlic in butter over medium heat 15 to 20 minutes, stirring frequently, or until onions are golden brown. Remove from heat; set aside. 5 Spray15x10-inch pan with sides with Crisco® Original No-Stick Cooking Spray. Unroll pizza crust dough in pan; press dough to edges of pan. Bake 7 minutes. Remove from oven. 6 Spread onion mixture over partially baked crust; top with drained tomatoes. 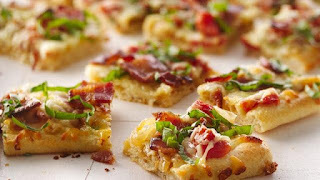 Sprinkle with mozzarella and Parmesan cheeses; top with bacon. 7 Bake 7 to 11 minutes or until crust is golden brown and cheeses are melted. 8 Remove from oven; sprinkle with basil. Congratulations! Looks yummy - can't wait to make these!